EuroAirport Basel Mulhouse Freiburg (IATA: MLH, BSL, EAP, ICAO: LFSB, LSZM)[note 1] is an international airport 3.5 km (2.2 mi) northwest of the city of Basel, Switzerland, 20 km (12 mi) southeast of Mulhouse in France, and 46 km (29 mi) south-southwest of Freiburg im Breisgau in Germany. The Franco-Swiss administered airport is geographically located within the French Alsace region, in the administrative commune of Saint-Louis near the border tripoint between France, Germany, and Switzerland. The airport serves as a base for easyJet Switzerland and features mainly flights to European metropolitan and leisure destinations. Plans for the construction of a joint Swiss–French airport started in the 1930s, but were halted by the Second World War. Swiss planners identified Basel as one of the four cities for which a main urban airport would be developed, but recognized that the existing airfield at Sternenfeld in Birsfelden was too small and, due development of the adjacent river port facilities, unsuitable for expansion. The suburb of Allschwil was proposed for a new airport, but this would require being constructed across the Franco-Swiss border, leading to talks with French authorities centered developing a single airport that would serve both countries, enhancing its international airport status. 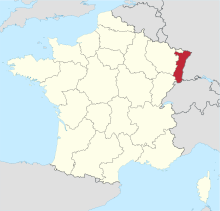 In 1946 talks resumed and it was agreed that an airport would be built 4 kilometres (2.5 mi) north of Blotzheim, France. France would provide the land and the Swiss canton of Basel-Stadt would cover the construction costs. Basel-Stadt's Grand Council agreed to pay the costs for a provisional airport even before an international treaty was signed (which was not until 1949). Construction began on 8 March 1946 and a provisional airport with a 1,200-metre (3,900 ft) runway was officially opened on 8 May. Between autumn 1951 and spring 1953, the east–west runway was extended to 1,600 metres (5,200 ft) and the "Zollfreistrasse" (customs-free road) was constructed, allowing access from Basel to the departure terminal without passing through French border controls. The first enlargement project was approved by referendum in Basel in 1960 and, over the following decades, the terminals and runways were continually extended. The north–south runway was extended further to 3,900 metres (12,800 ft) in 1972. In 1984, an annual total of 1 million passengers was reached. In 1987, the trademark name EuroAirport Basel–Mulhouse–Freiburg was introduced. In 1992 a total of 2 million passengers used the airport. By 1998, this number rose up to 3 million. A decision was made to enlarge the terminals again with a new "Y-finger" dock. The first phase was completed in 2002 and the second phase in 2005. Crossair was based at Basel and was its largest airline. Following the Swissair liquidation in 2001, the subsequent ending of services in early 2002, and the transformation of Crossair into Swiss International Air Lines, the number of flights from Basel fell and the new terminal was initially underused. In 2004 the low-cost carrier easyJet opened a base at Basel and the passenger totals rose again, reaching 4 million in 2006. From 2007 until 2009, Ryanair also flew to the airport for the first time. However, as result of a dispute over landing fees, the airline closed all eight routes. More recently Ryanair announced it would return in April 2014, with the resumption of Basel–Dublin route as well as the new route Basel – London–Stansted. Since then, Ryanair has hinted at the possibility of adding new routes in the foreseeable future. In December 2014, Swiss International Air Lines announced it would cease all operations at Basel by 31 May 2015 due to heavy competition from low-cost carriers. Swiss faced direct competition on five out of its six Basel routes, all of which were operated by Swiss Global Air Lines. The Lufthansa Group announced it would set up Eurowings' first base outside Germany at the EuroAirport as a replacement. However these plans were later cancelled in favour of Vienna International Airport. In January 2017, the removal of Basel/Mulhouse from Air Berlin and its Swiss subsidiary Belair's route networks was announced. EuroAirport is one of the few airports in the world operated jointly by two countries, in this case France and Switzerland. It is governed by a 1949 international convention. The headquarters of the airport's operations are located in Blotzheim, France. The airport is located completely on French soil; however, it has a Swiss customs area connected to Basel by a 2.5 km (1.6 mi) long customs road, thus allowing air travelers access into Switzerland bypassing French customs clearance. The airport is operated via a state treaty established in 1946 wherein the two countries (Switzerland and France) are granted access to the airport without any customs or other border restrictions. The airport's board has 8 members each from France and Switzerland and two advisers from Germany. The airport building is split into two separate sections – Swiss and French. Though the whole airport is on French soil and under French jurisdiction, the Swiss authorities have the authority to apply Swiss laws regarding customs, medical services and police work in the Swiss section, including the customs road connecting Basel with the airport. However, French police are allowed to execute random checks in the Swiss section as well. With Switzerland joining the Schengen Treaty in March 2009, the air side was rearranged to include a Schengen and non-Schengen zone. As border control is staffed by both Swiss and French border officers, passengers departing to or arriving from non-Schengen countries may receive either a Swiss or French passport stamp, depending on which officer they happen to approach. Due to its international status, EuroAirport has three IATA airport codes: BSL (Basel) is the Swiss code, MLH (Mulhouse) is the French code and EAP (EuroAirport) is the neutral code. The ICAO airport code is: LFSB, sometimes LSZM is used to designate the Swiss airport. The EuroAirport consists of a single terminal building, a brick-style main area with four levels and the Y-shaped gate area attached to it. The basement (Level 1) contains the access to the car park, the ground level (Level 2) features the arrivals facilities. Level 3 is the check-in area divided into halls 1-4 while the departure gates are located at Level 4. The gate area features gates 1-2, 20-46, 60-61 and 78-87 of which gates 22-32 are used for non-Schengen flights. Six of the boarding gates feature jet bridges, the others are used for walk- or bus-boarding. As described above, the landside areas are uniquely divided into a French and a Swiss part. The headquarters of Swiss International Air Lines and Swiss Global Air Lines are on the grounds at EuroAirport Basel–Mulhouse–Freiburg in the Swiss section of the airport; even though the airport is within France, the Swiss head office is only accessible from Switzerland. The Swiss division Swiss Aviation Software has its head office there as well. Farnair Switzerland formerly had its head office at EuroAirport. As in the case of the Swiss head office, the area with the former Farnair head office may only be accessed from Switzerland. The head office moved to its current location, the Villa Guggenheim in Allschwil, in proximity to EuroAirport, on 1 October 2011. Hello, a now defunct Swiss airline, had its head office in the General Aviation area of EuroAirport. Prior to the formation of Swiss International Air Lines, the regional airline Crossair was headquartered on the grounds of EuroAirport. Prior to its dissolution, Crossair Europe was headquartered on the grounds of EuroAirport as well. The airport is connected to motorway A3 which leads from Basel to the southeast of Switzerland passing Zürich. On the Swiss exit Basel's BVB bus No. 50 connects the airport to Bahnhof SBB, which is the main Swiss and French railway station in Basel. During weekdays, there is a service every 7–8 minutes and on weekends, every 10 minutes during daytime. The duration of the trip is about 20 minutes. On the day of a visitor's arrival to Basel, a reservation confirmation from a local hotel guarantees a free transfer by public transport from the station or the EuroAirport to the hotel. On the French exit Saint-Louis' distribus bus No. 11 connects the airport to the gare SNCF, Saint-Louis's railway station in 10 minutes. The German private bus company Flixbus calls Zürich, Basel and Freiburg i.Br. up to five times a day. FlixBus however only serves the French exit of the airport. Serving Swiss destinations from the French part of the airport is a questionable legal trick, as people transport by foreign companies inside of Switzerland is illegal without official authorization due to cabotage regulations, which will not be granted by Swiss authorities on routes already supported by tax-financed public services. It's illegal to travel between Swiss destinations only. Police started to do random checks and to fine failing travelers. Serving Swiss destinations from abroad however is compliant. ^ a b LFSB – BÂLE-MULHOUSE. AIP from French Service d'information aéronautique, effective 28 March 2019. ^ "Annual Report 2013 (2/3): Key Figures" (PDF) (annual report) (in French, German, and English). l’Aéroport de Bâle-Mulhouse. 21 May 2014. Retrieved 6 November 2014. ^ Bell, E. A. (10 May 1945). "Swiss Planning". Flight and Aircraft Engineer. Royal Aero Club. XLVII (1898): 501. Retrieved 5 July 2016. ^ "EuroAirport - Serving the needs of the RegioTriRhena". EuroAirport Basel Mulhouse Freiburg. Retrieved 6 June 2015. ^ "Ryanair verlässt den EuroAiport". baz.ch/. Retrieved 6 June 2015. ^ "Kurznachrichten: SWISS verlässt Basel, Regierungsterminal in Berlin und Fluggastzahlen von Air France". airportzentrale.de. Retrieved 6 June 2015. ^ "Lufthansa-Billigairline: Eurowings: Wien statt Basel - aeroTELEGRAPH". aeroTELEGRAPH. Retrieved 6 June 2015. ^ "Das Streckennetz der new airberlin - airberlin.com". Archived from the original on 11 February 2017. Retrieved 26 February 2017. ^ Cochennec, Yann (27 August 2018). "Des avions et des hommes : destination EuroAirport". www.air-cosmos.com. Retrieved 15 January 2019. ^ "General conditions of use Archived 28 March 2013 at the Wayback Machine". EuroAirport. Retrieved on 24 September 2009. "The Site is published by Basel–Mulhouse Airport, a Franco-Swiss public enterprise governed by the international convention of 4 July 1949 concerning its construction and operation and the headquarters of which are situated at 68730 Blotzheim, France". ^ a b "Schweizerisch-Französischer Staatsvertrag vom 4. Juli 1949 (Höflichkeitsübersetzung)" (in German). EuroAirport Basel Mulhouse Freiburg. 1 November 2006. Retrieved 5 November 2014. ^ "Terminal plan". EuroAirport Basel Mulhouse Freiburg. Archived from the original on 12 May 2012. Retrieved 5 November 2014. ^ "Terminalplan". Archived from the original on 29 March 2015. Retrieved 6 June 2015. ^ "Timetable". Retrieved 6 June 2015. ^ "Laudamotion outlines summer 2018 operations". routesonline.com. 16 March 2018. ^ "TAP lança rotas para Telavive, Dublin e Basileia — e há voos para Israel a 120€" (in Portuguese). NiT. 10 September 2018. Retrieved 10 September 2018. ^ "Wizz Air announces third aircraft to its Kutaisi fleet and launches six low cost routes". wizzair.com. 31 January 2019. ^ "AIRBRIDGECARGO AIRLINES FIRST FLIGHT GETS A SPLASHING WELCOME AT BASEL AIRPORT". AirBridgeCargo Airlines. Archived from the original on 19 April 2015. Retrieved 23 September 2014. ^ "Statistiken des EuroAirport - Statistiken des Flughafens Basel-Mulhouse". Retrieved 6 June 2015. ^ Peter Sennhauser, David Bauer. "Mehr Passagiere, weniger Flugzeuge, mehr Klagen: Die Entwicklung des EuroAirport Basel-Mulhouse in sieben Grafiken - TagesWoche ". Tageswoche. Retrieved 6 June 2015. ^ "Facts and figures Archived 1 February 2010 at the Wayback Machine". Swiss International Air Lines. Retrieved on 13 June 2009. ^ "Swiss International Air Lines Basel Archived 25 July 2011 at the Wayback Machine". Swiss International Air Lines. Retrieved on 24 September 2009. ^ "CONTACT". Swiss Aviation Software. Retrieved on 17 September 2011. "Swiss AviationSoftware Ltd. BSLSAS/MA P.O.Box, CH-4002 Basel, Switzerland Marketing & Administration" The location is implied by this picture Archived 27 March 2012 at the Wayback Machine which is of the Swiss head office at Basel Airport. ^ "How to find us". Farnair Europe. Retrieved on 8 December 2010. ^ "Contact Us". (Archived 20 February 2012 at WebCite) Farnair Switzerland. Retrieved on 19 February 2012. ^ "Hello Location Archived 10 November 2010 at the Wayback Machine". (Direct image link) Hello. Retrieved on 1 July 2010. ^ "Location". Crossair. Retrieved on 13 June 2009. ^ World Airline Directory. Flight International. 23–29 March 2004. 58. ^ "BVB – Line network". Basel, Switzerland: BVB. Archived from the original on 28 May 2011. Retrieved 5 November 2014. ^ "Mobility Ticket". Basel, Switzerland: Basel Tourismus. Archived from the original on 22 August 2016. Retrieved 17 August 2016. ^ "distribus ligne 11" (PDF). Saint-Louis, France: distribus. Retrieved 5 November 2014. ^ Petar Marjanovic (16 June 2016). "Umstrittene SBB-Konkurrenz: Bund will Fernbus-Tricksern an den Kragen". Blick (in German). Zurich, Switzerland. Retrieved 3 July 2016. ^ SDA/gr (10 November 2016). "Bundesrat über Fernbus-Trickser: Verstösse kaum nachzuweisen!". Blick (in German). Zurich, Switzerland. Retrieved 3 July 2016. "Franco-Swiss treaty for the construction and use of Basel–Mulhouse airport in Blotzheim" (1949). Text available in French and German. This page was last edited on 18 April 2019, at 15:56 (UTC).